Of all the compilations in all the countries in all the world, on one cold winter’s day she showed up on mine – well, not mine per se, but CMJ New Music Monthly’s. And unlike Rick’s initial reaction to seeing Ilsa again, I’m glad she did. First, though: January 1994 wasn’t a snowy month for the Philly region, but it did feature some extreme weather. On the 7th and 8th, an ice storm paralyzed the city and suburbs; and, on the 19th, we “enjoyed” a not-so-balmy high of 7 degrees Fahrenheit. Major events that occurred: figure skater Nancy Kerrigan was attacked on the 6th in a plot hatched by rival Tonya Harding’s ex-husband; Vice President Al Gore chaired a Superhighway Summit in L.A. on the 11th; a major earthquake struck the L.A. area on the 17th that left 57 dead and 8700 injured; President Bill Clinton delivered his first State of the Union address on the 25th; and, on the 30th, the Dallas Cowboys defeated the Buffalo Bills in Super Bowl XXVIII. On the music front: the year opened with the Lemonheads’ wondrous “Into Your Arms” atop Billboard’s Modern Rock Hits chart. Other songs that topped that specific chart this month: Pearl Jam’s “Daughter,” the Gin Blossoms’ “Found Out About You” and Nirvana’s “All Apologies.” Mainstream hits included “Hero” by Mariah Carey, which held the top spot for the first three weeks of the month, and “All for One,” a collaboration between Bryan Adams, Rod Stewart and Sting that I’ve yet to hear. The ‘90s may not have been the ‘60s upside down, but they were a great time for music. A wealth of newer acts in all genres were crafting cool sounds and old-timers like Neil Young were doing the same – his early ‘90s run, which actually began in ’89 with Freedom, rivaled his work in the ‘70s. Alternative rock, which was really just rock cranked out by Gen Xers, was the Big Thing. Alt.country, as it was called, was an actual thing, too. Singer-songwriters were (finally) in vogue, again. Hip hop was mainstream. Rolling Stone and Spin were both solid music magazines with robust review sections, but there was so much music being released that many new releases weren’t mentioned in them, which is why I sought out additional magazines and newsletters. As a result, on an excursion to Tower Records on South Street or in the Northeast, I picked up the January issue of CMJ New Music Monthly, a habit I’d picked up a few months earlier. For those unfamiliar with it, the magazine mimicked the shape of a CD longbox, though (as I remember it, anyway) it wasn’t quite as long. (A CD longbox, for those unfamiliar with the term, was a cardboard sleeve that held the CD jewel box; they were used in the late ‘80s and early ‘90s because, when placed side by side, they took up the same space as a vinyl album, which meant retailers didn’t need to change their racks; and, too, they made shoplifting a bit more difficult.) 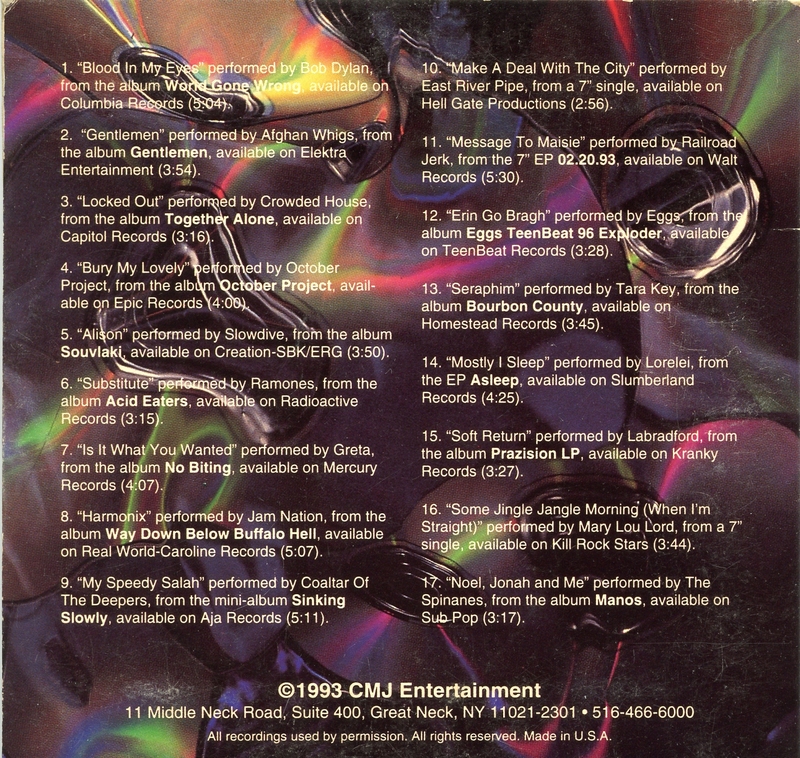 I enjoyed CMJ because it focused primarily on newer acts, many of which were ignored by Rolling Stone – and for the sampler CDs that were included with every issue. Though I no longer have the magazines themselves, I do have quite a few of the CDs. 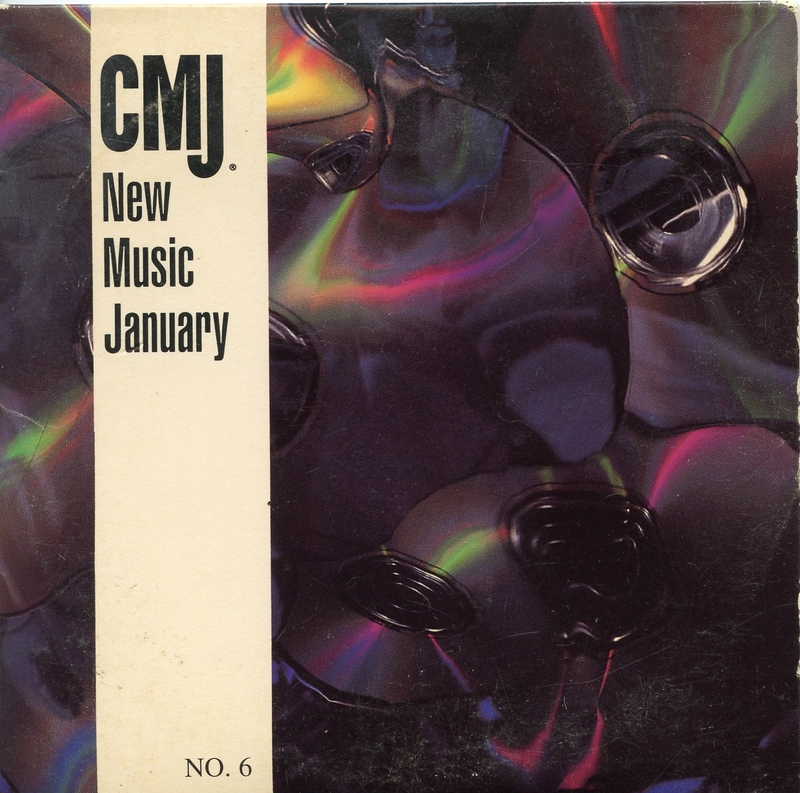 And, with all of that out of the way…welcome to today’s Top 5: January 1994, aka “Hello, Mary Lou,” which is drawn from CMJ Music Monthly’s January 1994 CD compilation. 1) Mary Lou Lord – “Some Jingle Jangle Morning (When I’m Straight).” The second-to-last song on the sampler is this, a digital conversion of a 7-inch single released by the Kill Rock Stars label. (The version on Mary Lou’s 1998 album Got No Shadow is a different recording.) Even now, after all these years, the song sends me to another place. Diane loved the song, too, and we both became major MLL fans as a result. 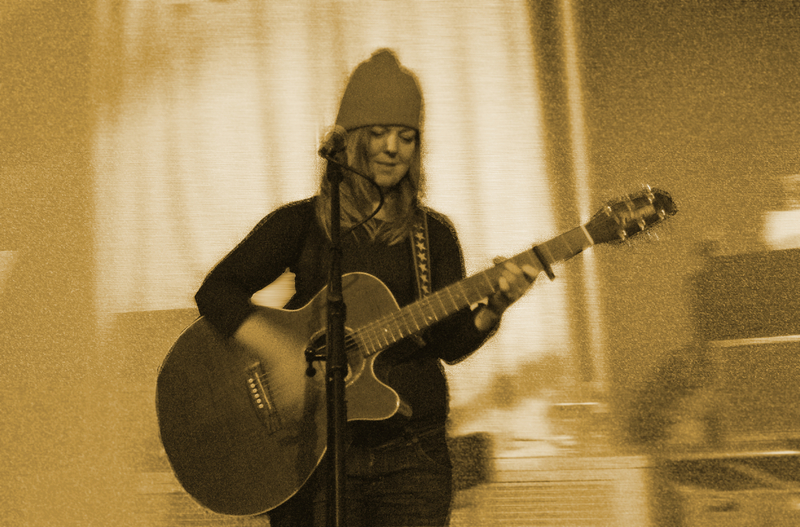 She’s released a handful of albums, including one last year, and a bounty of EPs; and we’ve seen her in concert twice, including once in the mid-‘90s at a swing-dance club in Philly, and again in the early 2010s at a house concert (which is where the photo came from). 2) Bob Dylan – “Blood in My Eyes.” As I said above, CMJ focused primarily on newer acts, but veteran acts sometimes snuck onto the compilation CDs. This song hails from Dylan’s 1993 album World Gone Wrong. 3) Tara Key – “Seraphim.” This punky, low-fi delight led me to buy Bourbon County. The song itself isn’t on YouTube, but here’s the album in full. 4) Lorelai – “Mostly I Sleep.” I never followed through and purchased anything by this Pittsburgh-based group, but this track is pretty cool – conjures the glorious Three O’Clock. All these artists and songs new to me. (Well, except the Nobel Prize winner/ringer.) So thanks for that. Three of the five songs are on Spotify – four if we’re allowed to count the alternate recording of Ms. Lord’s track, which is also on the Zero Effect soundtrack album from 1998. I only mention Spotify because my browser (Chrome) is not displaying what I assume, based on the spaces between each song’s write up, were the YouTube videos for each track you hunted down and posted. My own extremely limited experience with the parent periodical CMJ can be read HERE.